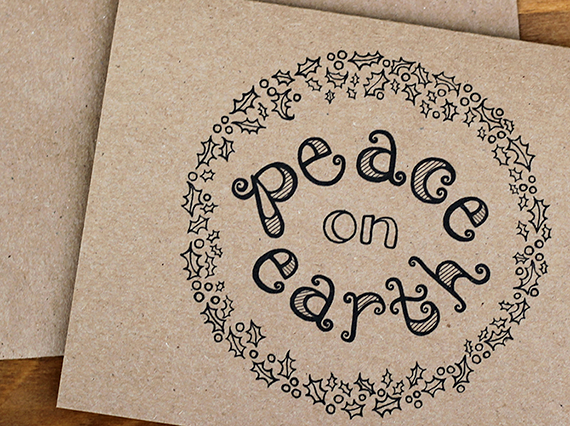 Bubby and Bean ::: Living Creatively: Introducing the 2012 Holiday Card Collection! 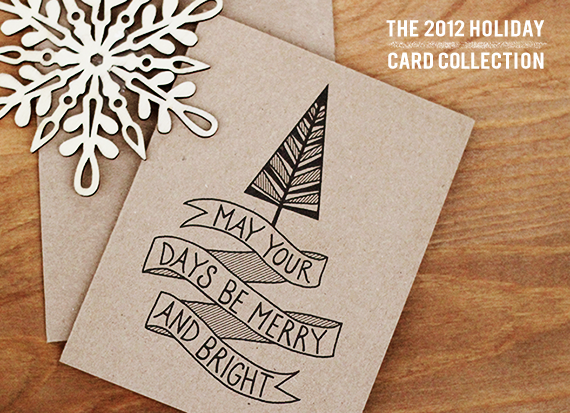 Introducing the 2012 Holiday Card Collection! I'm so excited to introduce the 2012 Bubby & Bean Holiday Card Collection! I started this line back in 2010 with two cards ('Joy to the World' and 'Santa Bubby'). In 2011, I wanted to do a mid-century modern inspired collection, and expanded into a few more designs that were more geometry focused with clean lines and bold graphics (like this one and this one). This year, I decided to include hand-lettered and hand-drawn styles, as well as some typographic designs, all with a homespun, rustic feel. I started sketching ideas back in July, and spent the last few months finalizing the illustrations and designing them into actual cards. I chose natural kraft paper for the cards and envelopes, and I'm really happy with the look, as well as the fact that they're completely eco-friendly (100% recycled papers without any dyes or bleaches). This is definitely my favorite collection to date, and I'm looking forward to sitting down and writing out messages in them to send to my own friends and family over the next few weeks. The cards are available in the Bubby & Bean Art Shop as singles and sets of 10, but can be packaged in any quantities that are requested. And because I love you guys, I'm offering blog readers a 15% discount on them (today through November 17th) with code BLOG15. Just click here to check out the entire collection. And as always, I appreciate your support and feedback! I love these cards so much!!!! The drawings are so detailed and beautiful and the bah humbug one is so cute, haha :-). SO CUTE! 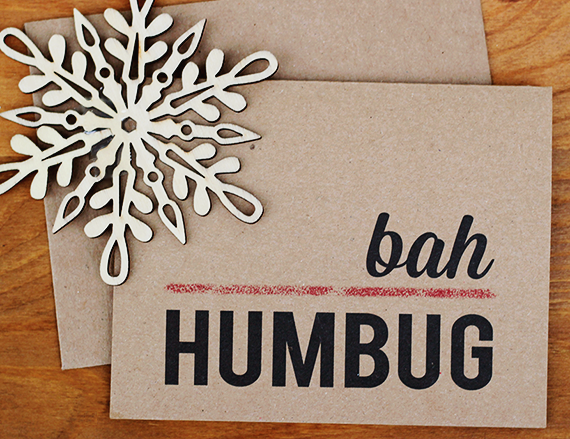 Bah humbug is a funny one. :) Looking at this post has gotten me in the Christmas spirit! Love these! They are so simple and beautiful. Nice work :). So great! You did a beautiful job on the design. I absolutely love that they are printed on that type/color of paper, so cute! They are beautiful. Well done! 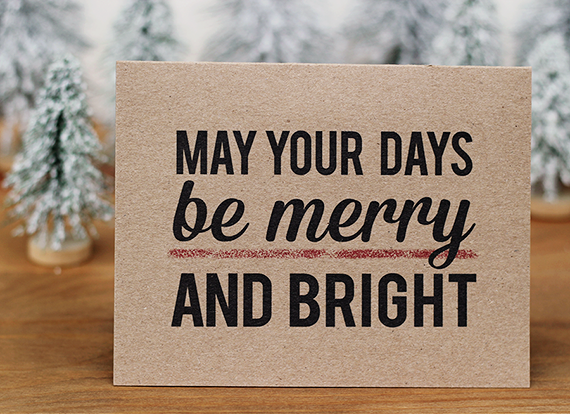 I like the merry & bright card. Bold typography is one of my favorite styles to see on cards. I really like these cards! Very cute. These are great! I love the bold black ink on the kraft paper! these turned out just lovely. i always gravitate toward kraft paper...it's my favorite. aww i love the designs! Absolutely beautiful designs! I love the first one so much. 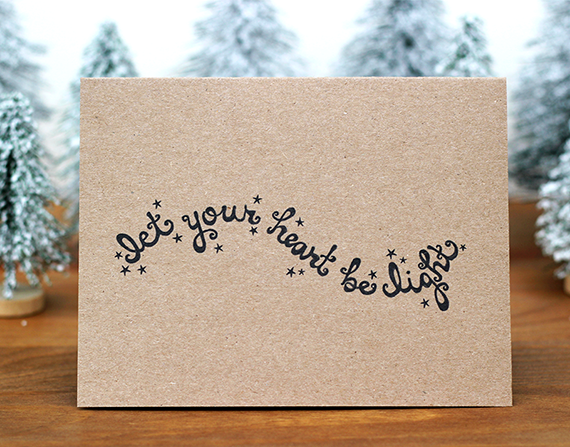 I am just so enamored with your hand-drawn artwork, even when it's "just" words and simple sayings! Seriously, I lovelovelove you style, and am so happy to see these in you shop. I seriously can't wait to see even more (which I hope you get a chance to get around to.) Beautiful, beautiful, beautiful! My goodness, apparently I don't like the letter "r". Both of those "you"s above should be "your"s haha. these are so beautiful, in love!